This is a DIY, so all legal disclaimers typically associated with DIY instructions apply, e.g. I accept no responsibility. 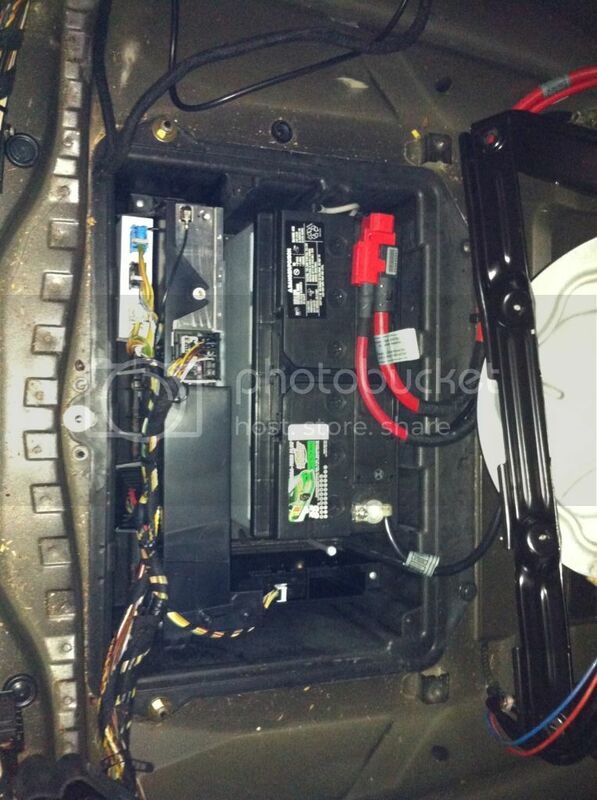 - You will also notice that I did not disconnect the battery negative terminal until I got to the electronics in the trunk. This is primarily because I needed to move the driver seat forward/back in order to access the bolts securing the seat to the floor. 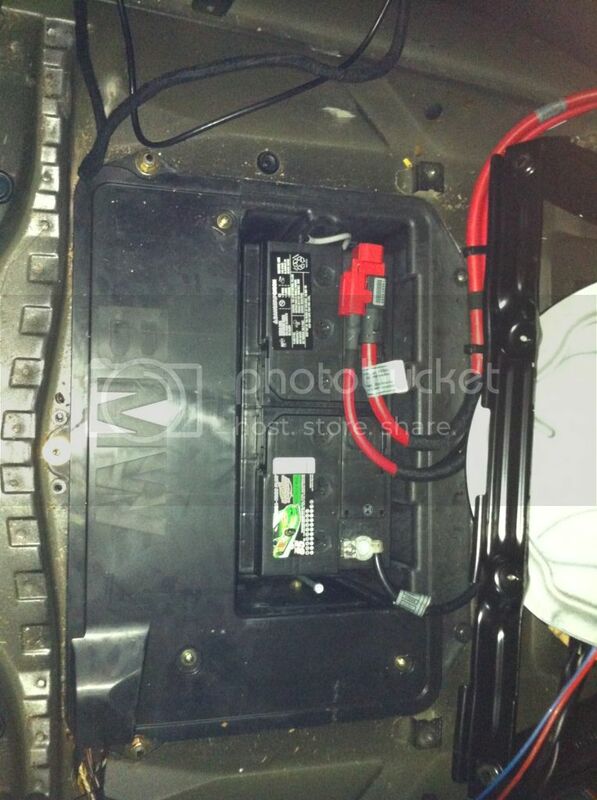 You can choose to disconnect the battery earlier if you'd like to be on the safe side, and just plug it back in as needed to move the driver seat. 2. 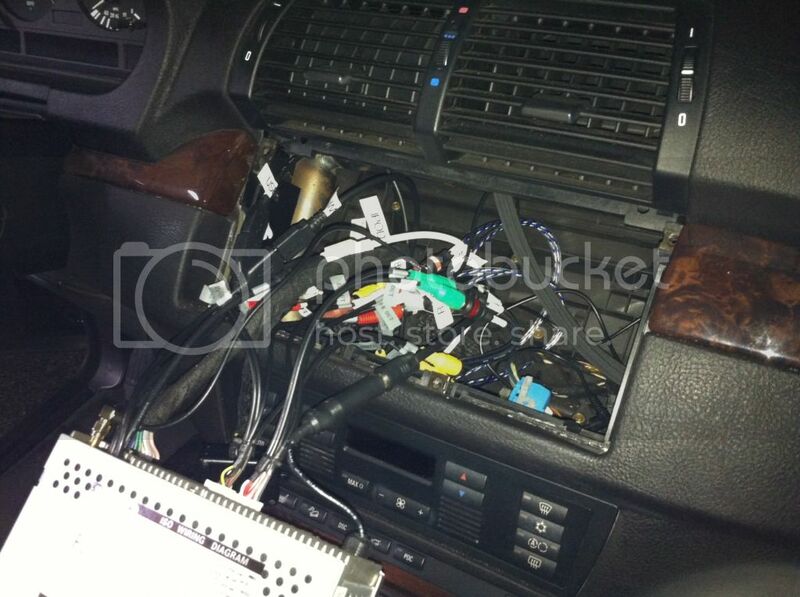 The Fakra connector to the radio in the trunk does not include wiring for the head unit's button illuminations. So in order to provide power for the Dynavin's button illuminations, you will need to provide a power source for the ORANGE wire in the Fakra extension cable. 3. 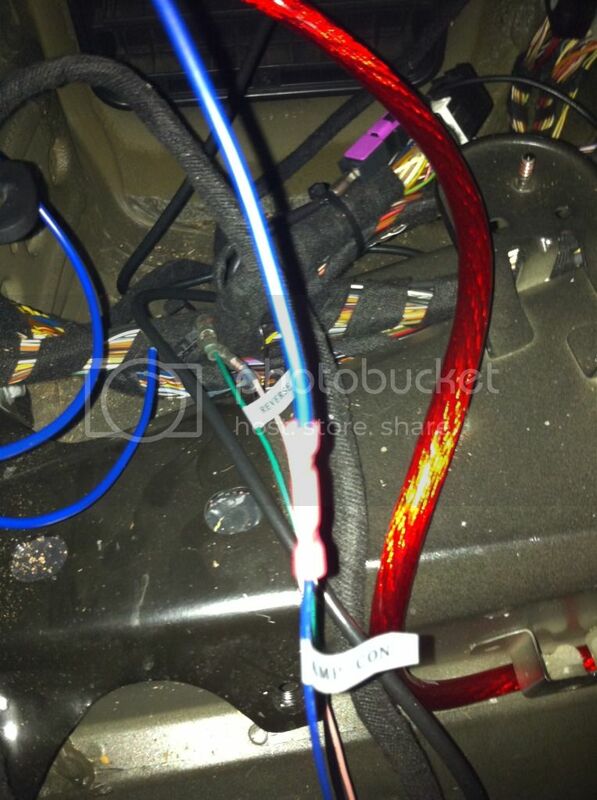 The easiest option is to splice the orange wire in the Fakra to the red ignition wire in the Fakra. This way the Dynavin's button lighting will turn on when the car is on. 4. Pop out the overhead light using a trim removal tool. Best to work from the back of the light and pop it down. Disconnect the wires and set the overhead light aside. 5. From the overhead light module opening, you should be able to put a finger through and pop out one of the extra unused overhead console caps. 9. 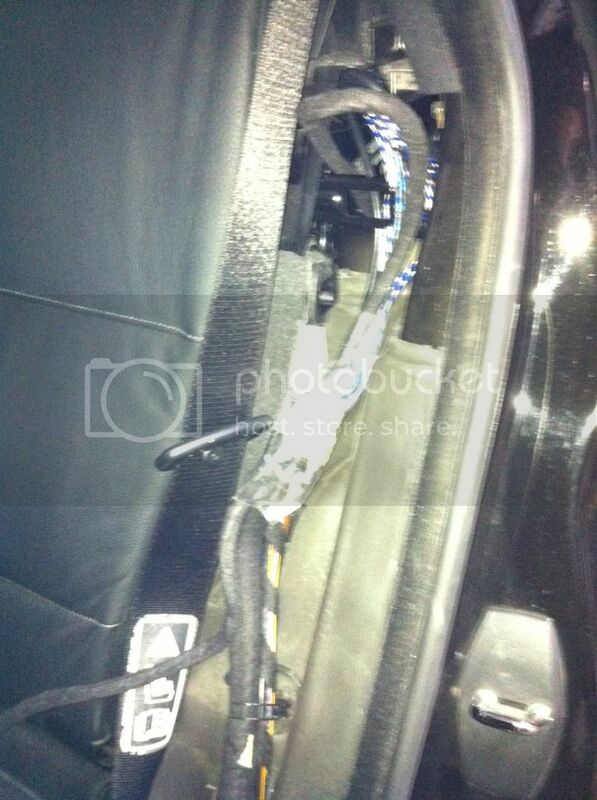 Run the mic wire along the edge of the front windshield and roof liner and down the A-pillar to the dash. 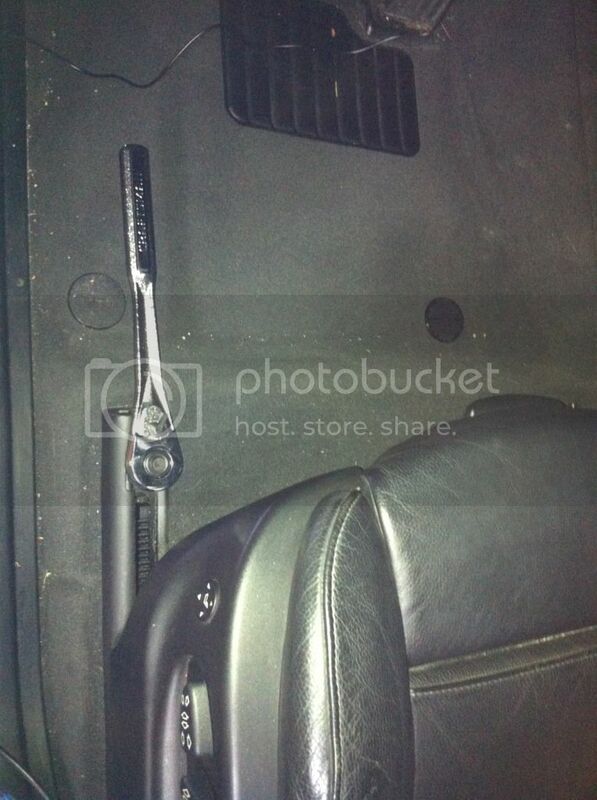 This is easily done using a trim removal tool to tuck the mic wire into the roof/A-pillar liner. 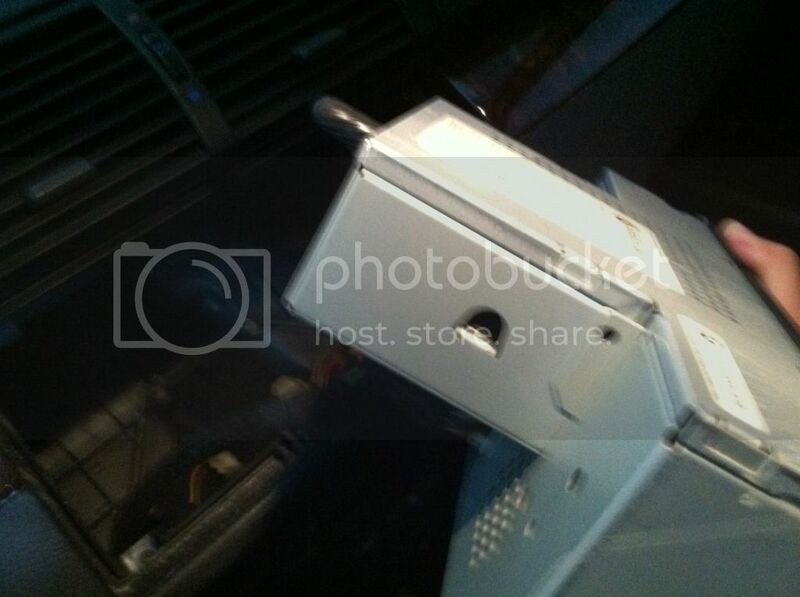 In my case, I ran it to the driver side as I did not want to remove the glovebox. 11. 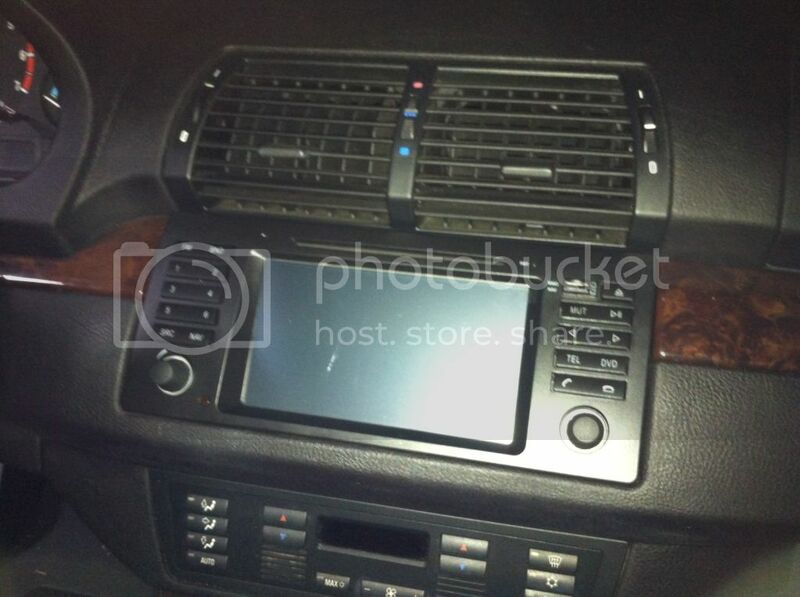 Run the mic wire and GPS wire down the edge of the dash and the door weather strip. Use a trim removal tool to tuck the wires secure in. 12. 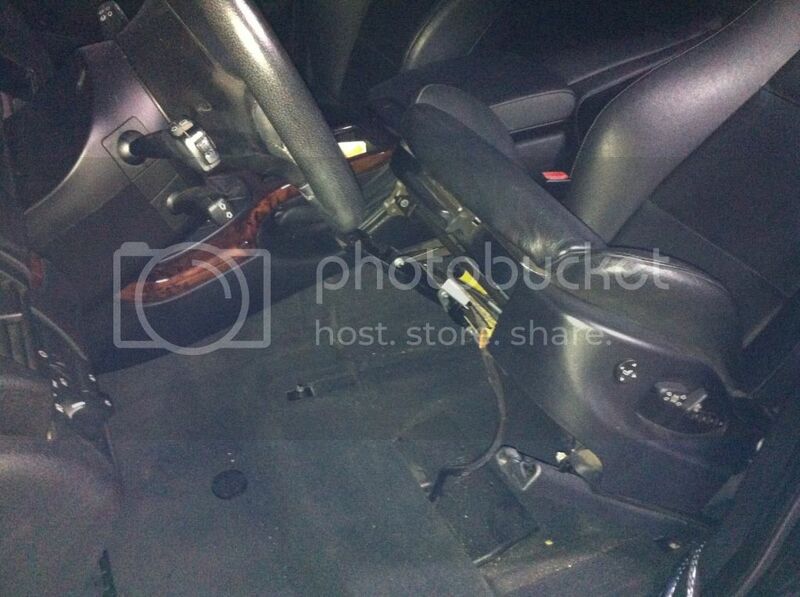 Remove the black plastic cover under the steering column, where the brake pedals are. There are 4 screws and 2 plastic knobs to remove and the plastic cover should drop down. 13. 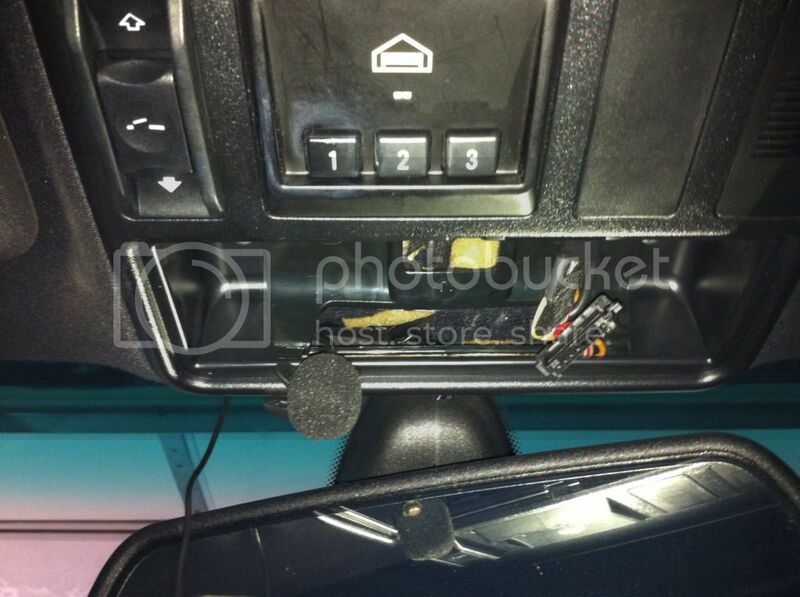 Tuck the mic wire and GPS wire under the dash, making sure to keep it away from any steering and brake pedal components. 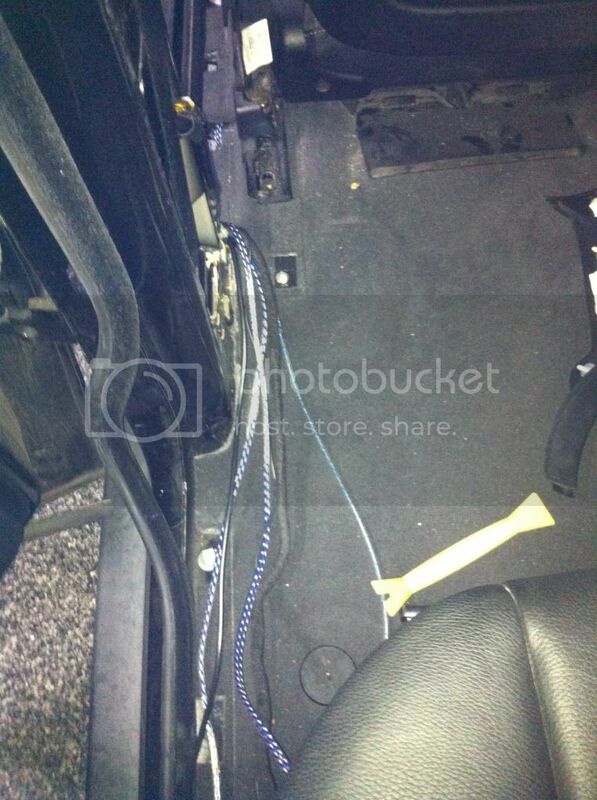 Run the wires to the center console end and leave the wires there for now. 15. 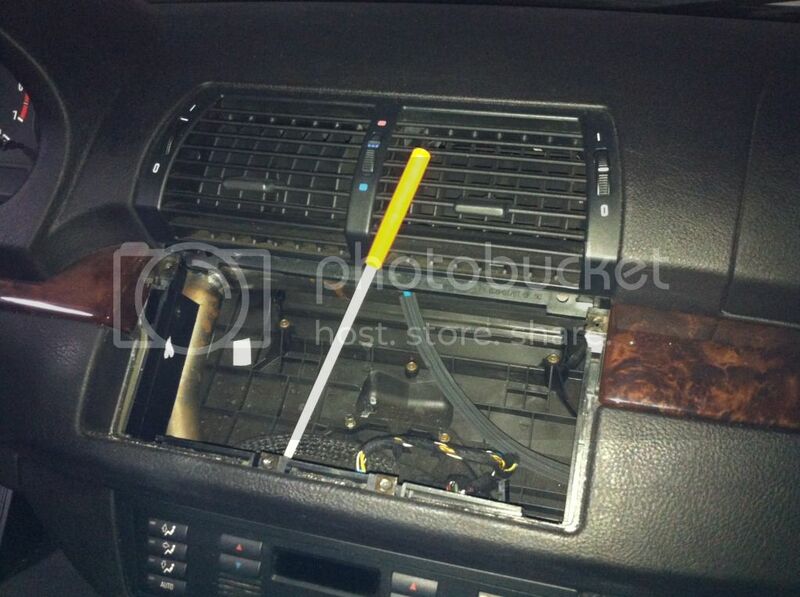 Remove cigarette ashtray, just pull it up and out. Set the ashtray aside. 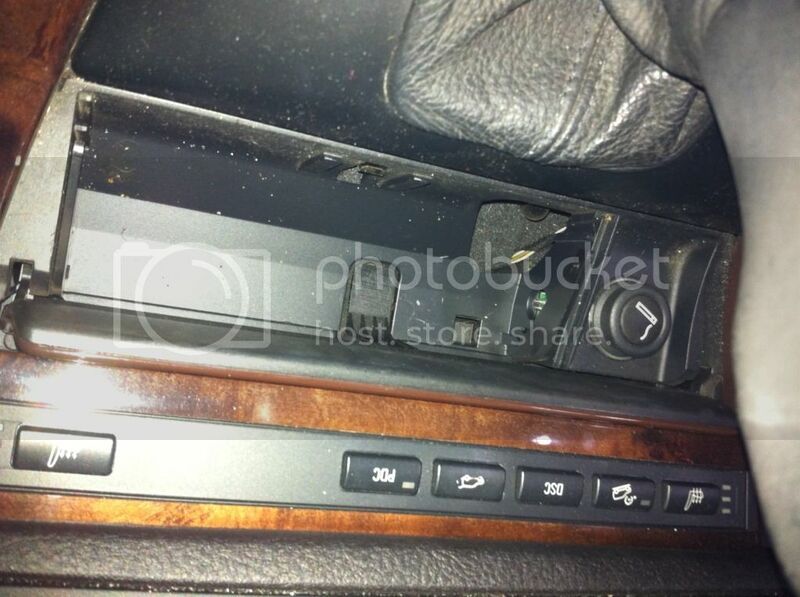 Under the ashtray you will notice an opening in the left corner. This is where the USB extension, 3.5mm AUX, and iPod connectors will be run. 16. Unbolt the driver seat. There are 4 bolts you will need to remove. There are 2 nuts in the front, typically under a round plastic/rubber cap. There are 2 screws in the back. 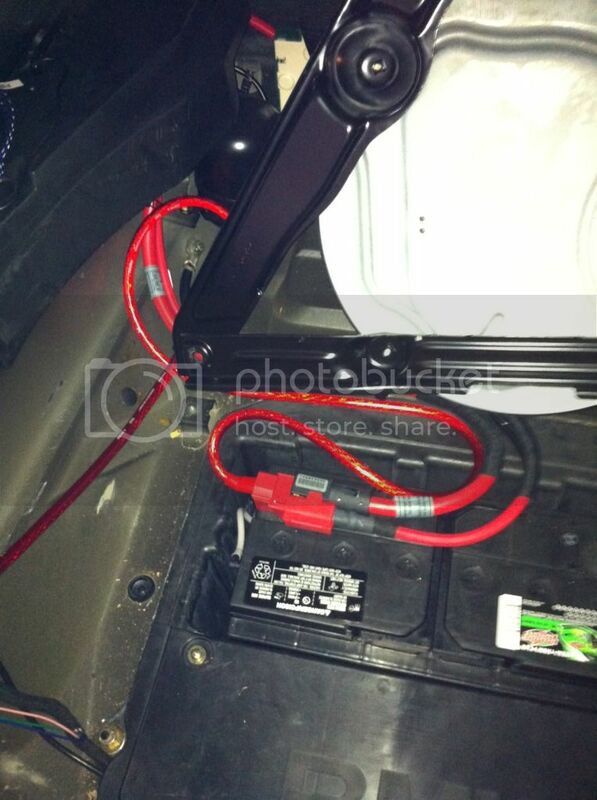 You'll need to move the seat forward and back to easily access these bolts (thus, do not disconnect the battery just yet). 18. 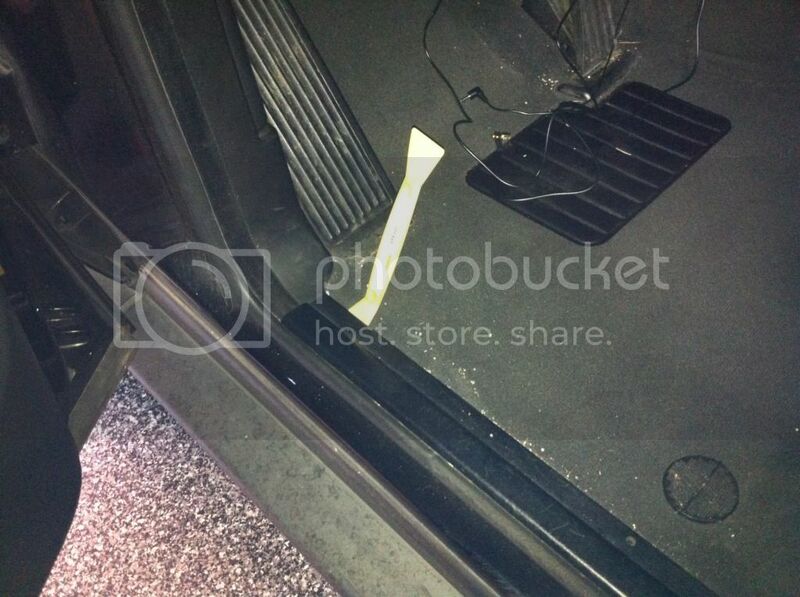 Remove the carpet trim along the center console. 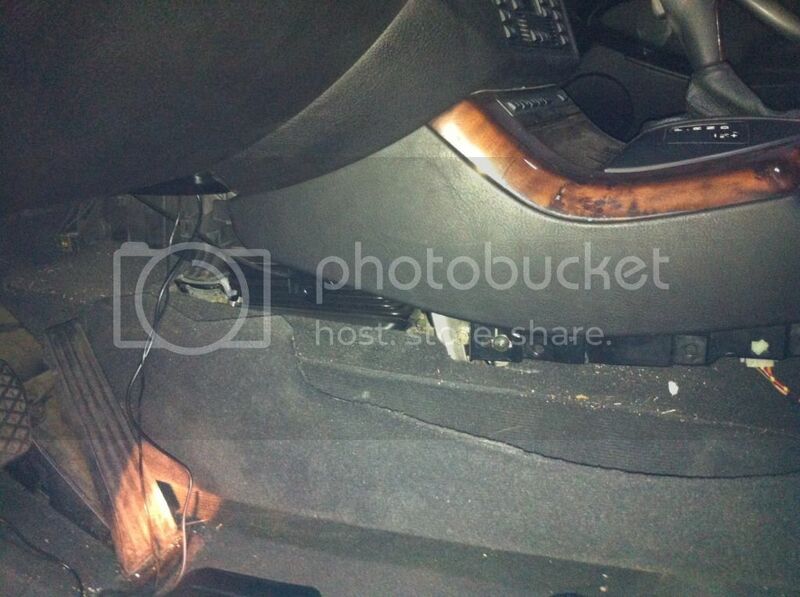 There is one screw towards the front next to the gas pedal to remove. Then carefully run your hand under the carpet trim and pull it straight out. I found it easier to work from the front towards the back. 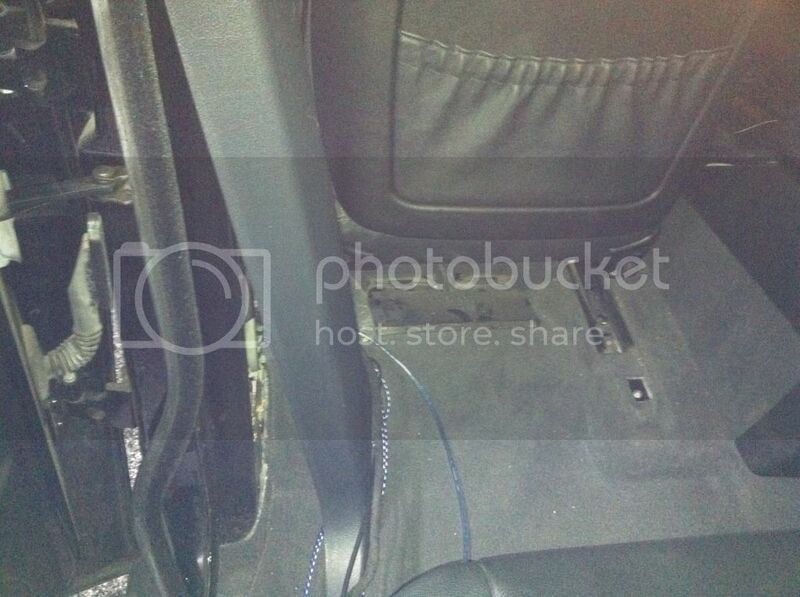 Now the side of the center console is expose to run your wires. 24. Snake the various wires up to the dash/head unit opening. That would be the following wires at this point: mic wire, GPS antenna wire, 2 USB extension, 3.5mm AUX/RCA, and iPod extension cables. 27. 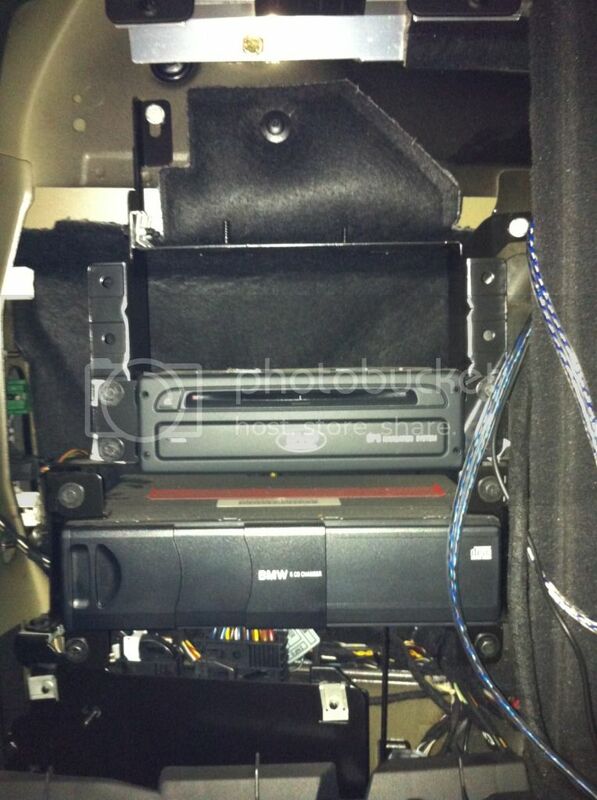 Run the Fakra/radio/audio/video cables from the center console to the driver side door. With the driver seat unbolted and leaned back, you will see that you can lift up the carpet line under the driver seat location. 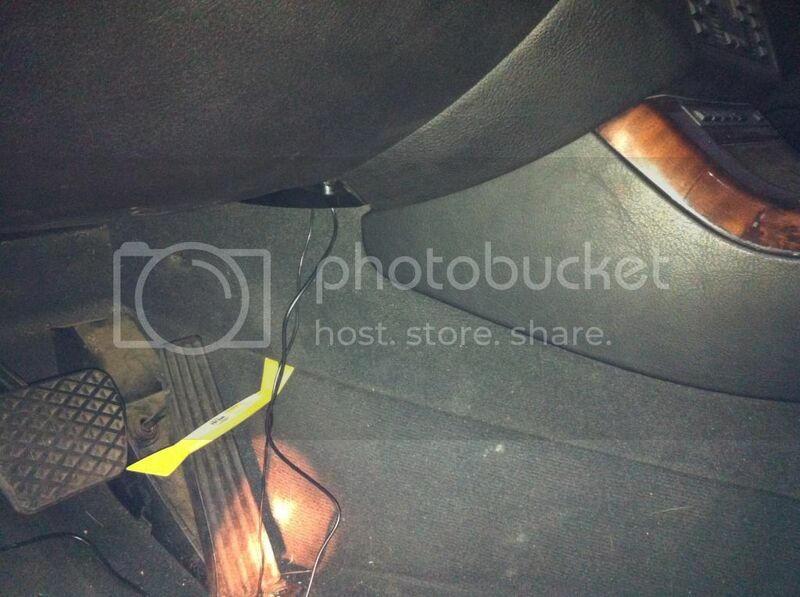 Tuck all the wires under the carpeting, making sure to keep the wires away from the holes where the seats are secured to. 30. 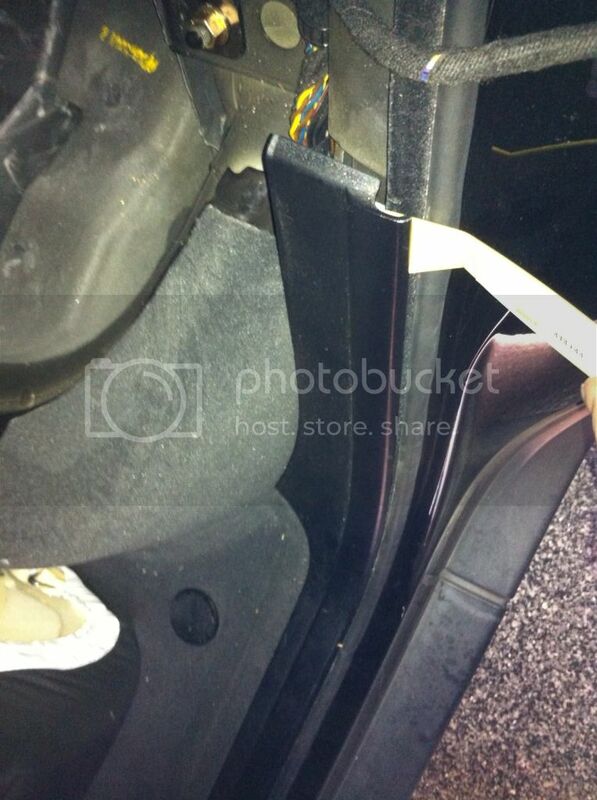 Remove the plastic trim piece along the driver side door/floor using a trim removal tool. I found that working the plastic trim from the front first and working towards the back is easiest. 31. 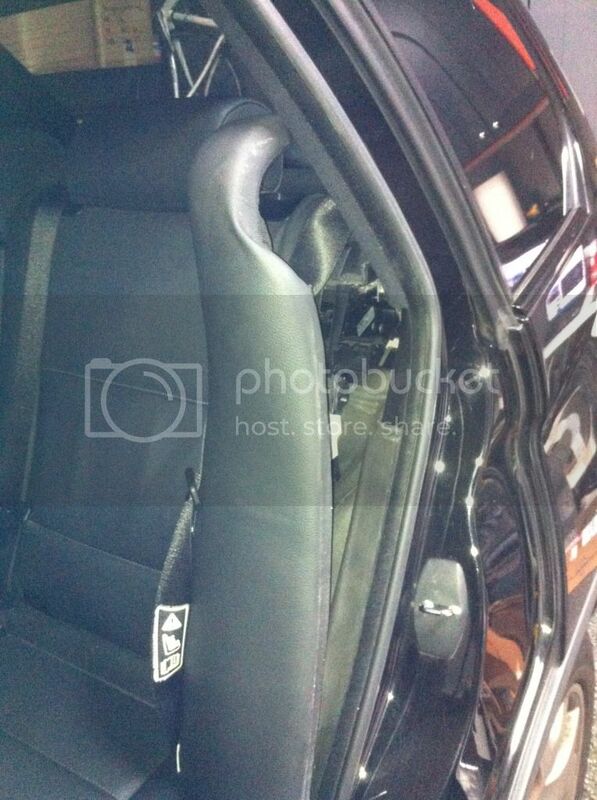 Moving to the rear seat area, remove the cushion back piece next to the door. Using your left hand, grab the top edge. Using your right hand, run your hand down the side of the back cushion nearest the door (approximately half way down). Then give it a firm pull out and the cushion piece should pop out. Note: The plastic clip may still be attached to the frame hook, just pop it out and reattach it to the cushion piece on the back side. Set the cushion piece aside. 33. 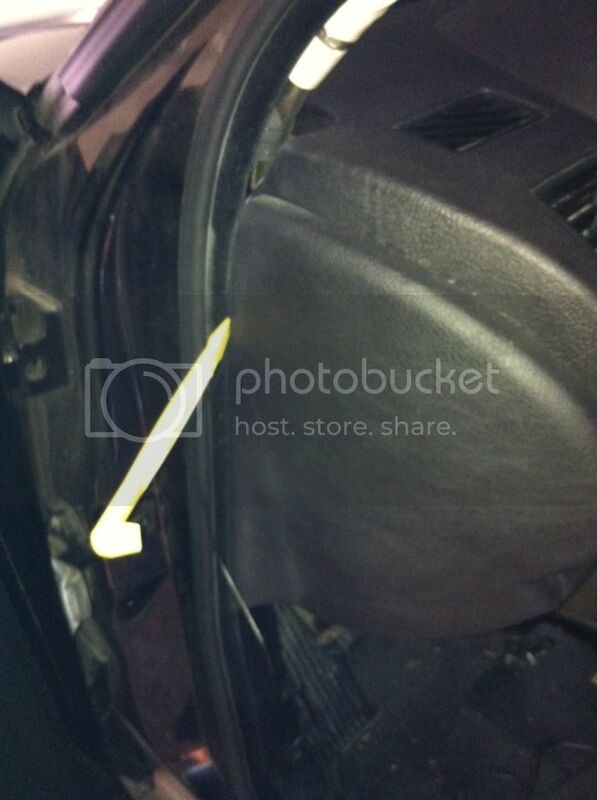 Remove the plastic trim piece along the rear side door/floor using a trim removal tool. I found that working the plastic trim from the back first and working towards the front is easiest. 34. Remove the lower B-pillar trim. 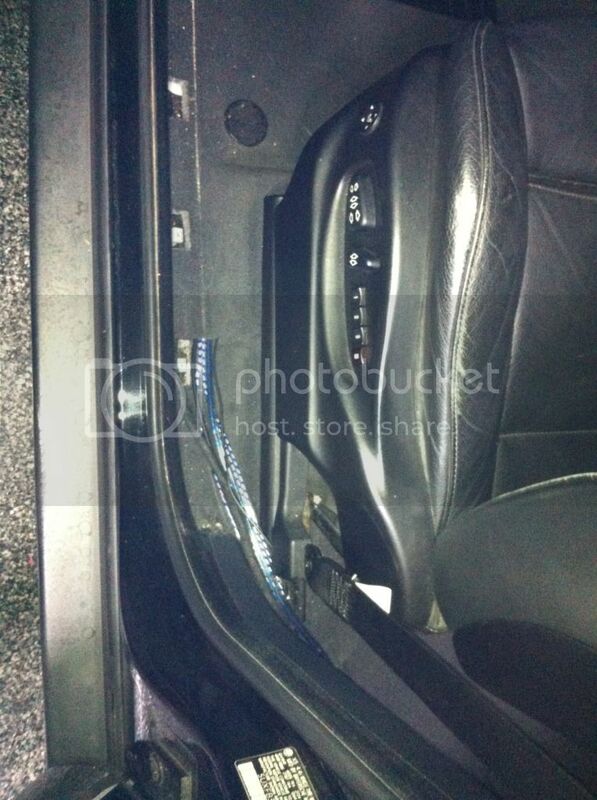 To do this, gently pull out the weather strip along the lower B-pillar trim in the front door and the rear door. Just remove enough to clear the lower B-pillar trim. 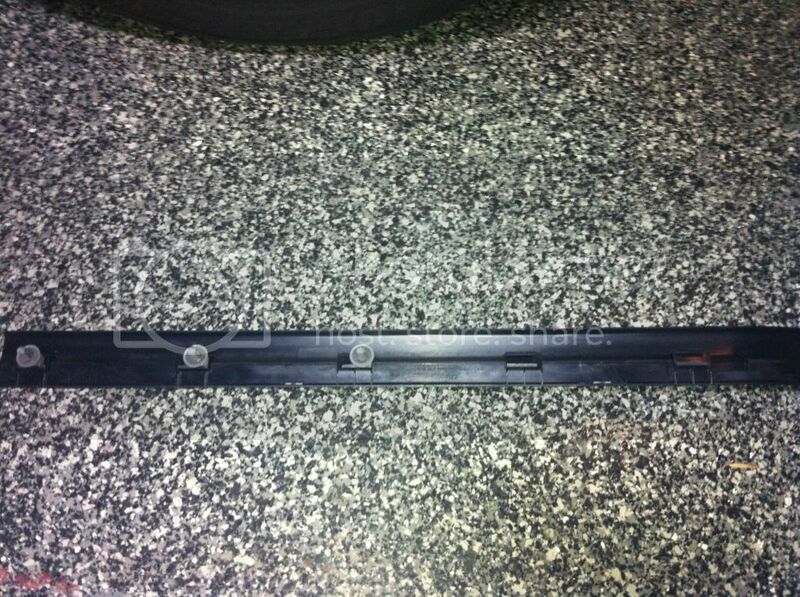 The weather strip comes off and can easily be pushed back into place. Once the weather strip is removed around the B-pillar trim, you can pull the trip straight outwards towards the center of the car interior. Work the back side first, and then move to the front side. 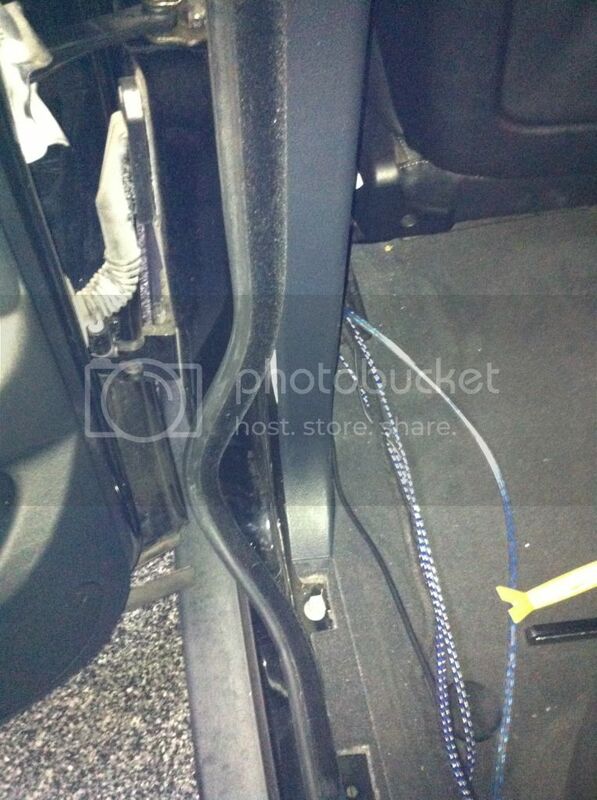 You may need to move the driver seat around (forward/backward) to remove the trim piece. 35. Now you have all the trims removed to access the carpeting to continue running the Fakra/radio/audio/video cables to the back. 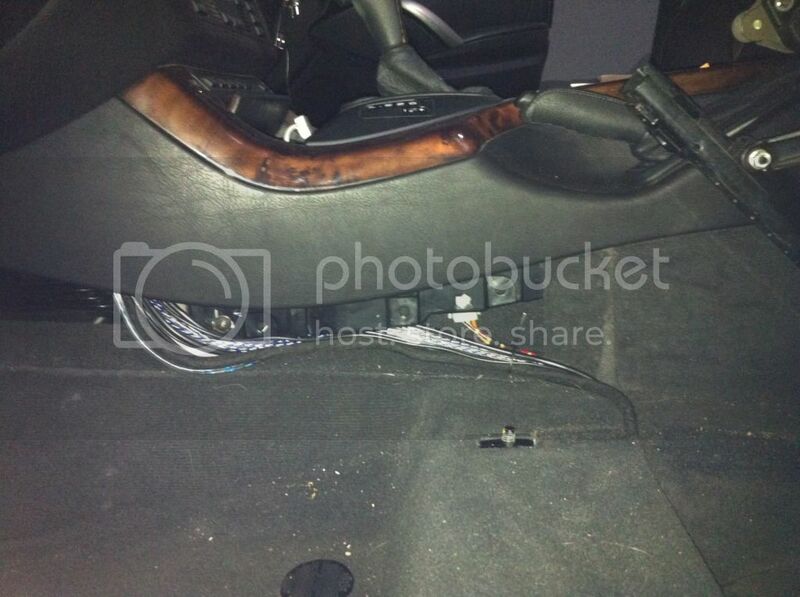 Proceed to tuck the Fakra/radio/audio/video cables completely underneath the carpeting, working your way from where you left off at the driver's seat. You should be able to carefully pull up the carpeting and tucking the wires as far in/below as possible, making sure to clear the holes for the plastic trims. 36. 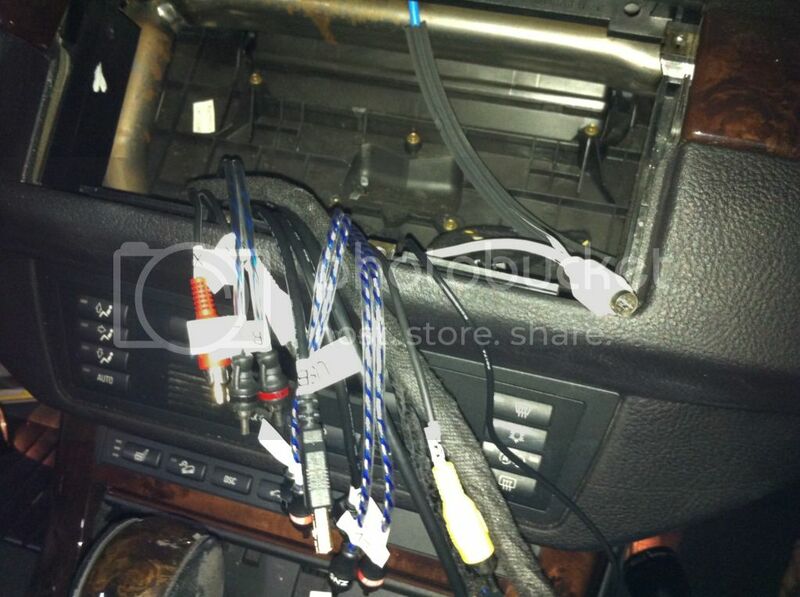 Continue working the Fakra/radio/audio/video cables up the back seat, using tie wraps to cleanly place the wires away from key areas where the back seat cushion connections to. 37. Once you have all the Fakra/radio/audio/video cables cleanly tucked away: reattach the B-pillar trim, push the weather strips back onto the body panel, reattach the plastic trim along the front driver door/floor, reattach the plastic trim along the rear passenger door/floor, reattach the driver seat and bolt it back on, reattach the rear passenger seat (make sure to get all the seatbelt buckles in their slots). 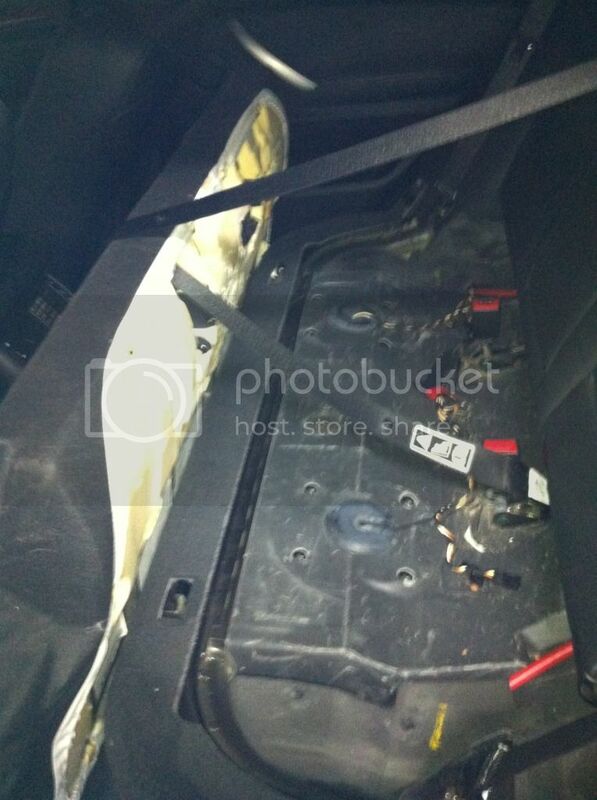 Note: we are not reattaching the rear seat back cushion yet at this point. 40. 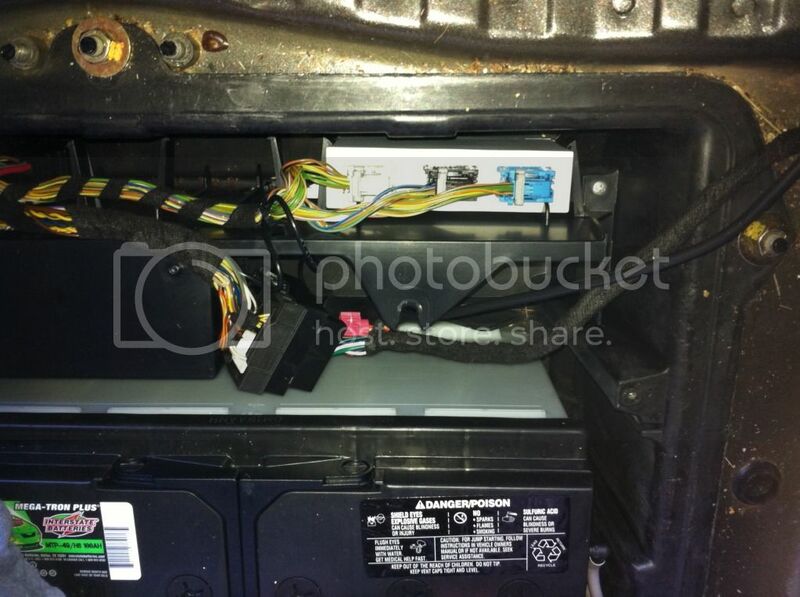 Remove the MKIV DVD drive and 6 disc CD changer in the left compartment (and any other components you might have in there). They are attached with 4 bolts each to the mounting bracket. Disconnect the wiring harnesses. 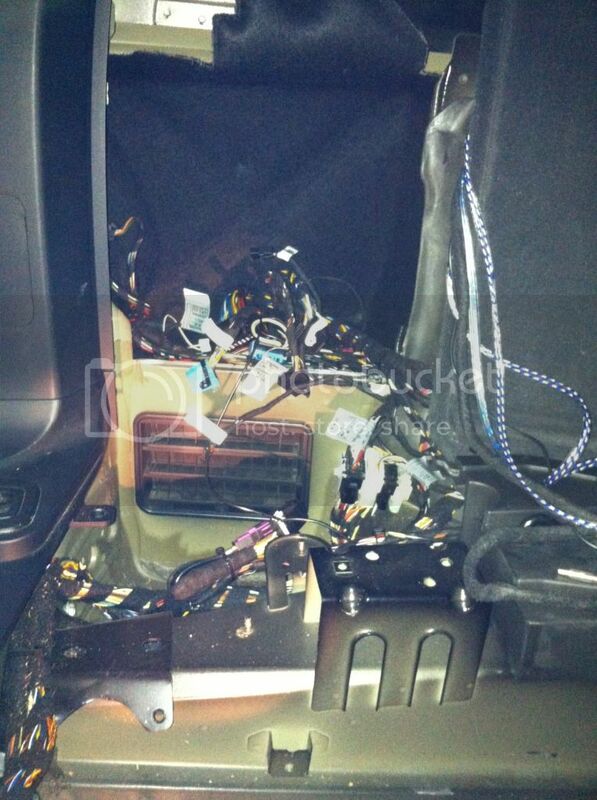 Tip: Unload all DVD/CD from the MKIV and CD changer. I labeled each of the wiring harnesses as I removed them for future reference if needed. 41. Detach the upper mounting bracket to free up space. It's connected to the lower bracket by 4 bolts. Tip: the 2 right bolts are behind a large wiring harness that's connected to the lower bracket. To detach the harness to easily access the 2 bolts, just turn the entire wiring harness (I forget if it was clock-wise or counter clock-wise) and it should easily come off of the lower bracket. 42. Disconnect the wiring harnesses to the DSP amp. 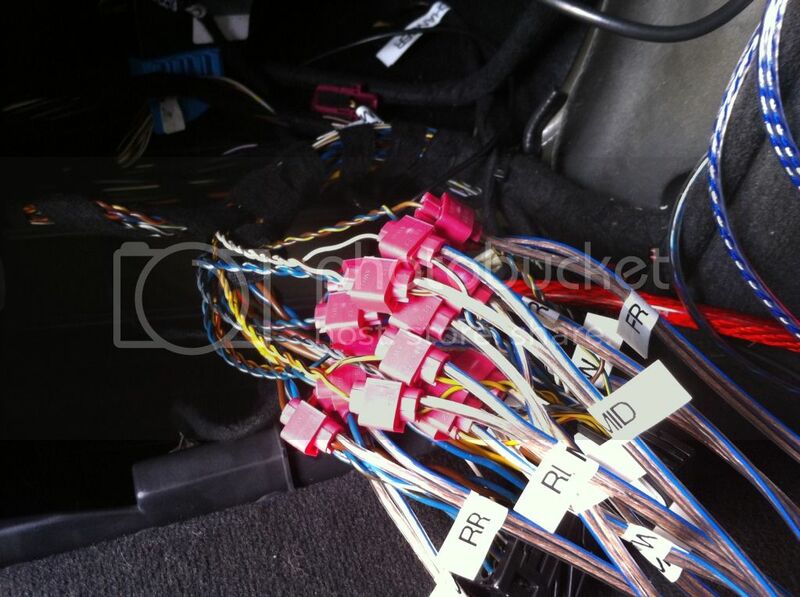 Tip: I labeled each of the wiring harnesses as I removed them for future reference if needed. 43. 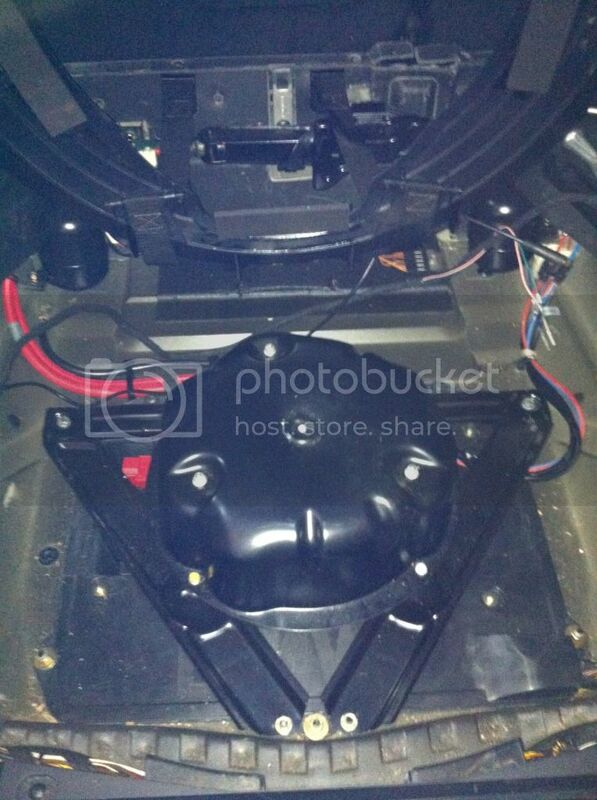 Detach the lower bracket from the vehicle frame, with the DSP amp in place. It is held in place by 5 bolts. Pull the DSP amp/bracket out. Remove the DSP amp from the lower mounting bracket and place them both aside. 44. 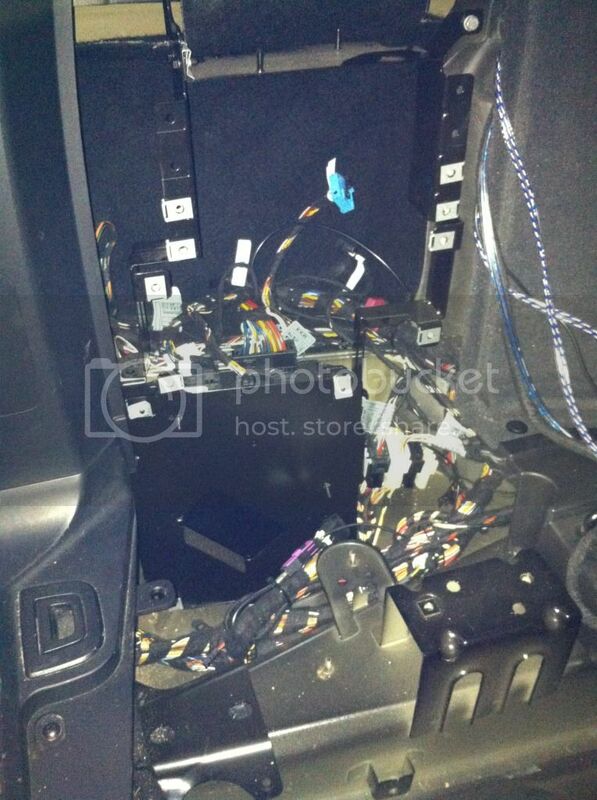 Continue working all the Fakra/radio/audio/video cables from the back seat, through the left compartment, into the trunk area. 45. 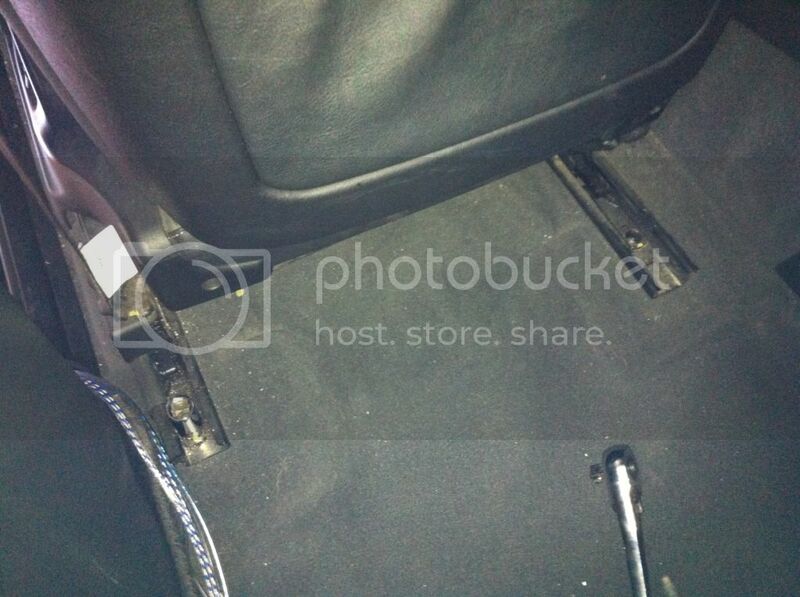 Reattach the rear seat back cushion. 47. Remove the radio module (optional). 48. Disconnect the radio antenna wire from the radio module. Using on of the radio antenna connector adapter that came with the Dynavin, plug it into the female end of the radio antenna extension cable that you've ran from the front head unit to the back. Connect the radio antenna extension cable to the radio antenna wire. 49. Disconnect the large square Fakra harness from the radio module. Connect the Fakra cable that you've ran from the front head unit to the back to the Fakra harness. 52. Assemble the new amp's ground cable. Connect the new amp's ground cable to the metal frame. Run the ground cable to the left compartment slot. 53. Connect the new amp's remote turn on cable to a switched power source. The Fakra cable has a few wires extended from it towards the end of the large Fakra harness. One of the blue wire is labeled Amp On/Con. Using a connector, I connected the remote turn on cable for the new amp to this blue wire from the Fakra cable. 54. Connect the speaker out wires from the new amp to each of the passive crossovers: FL/FR/RL/RR. 55. Now for the hairy part of the wiring, tapping in to power each of the 10 speakers for FL/FR/RL/RR. You will want to carefully look over the wiring diagram for the DSP amp to see which twisted pair of color combinations are for each of the component speakers. 56. 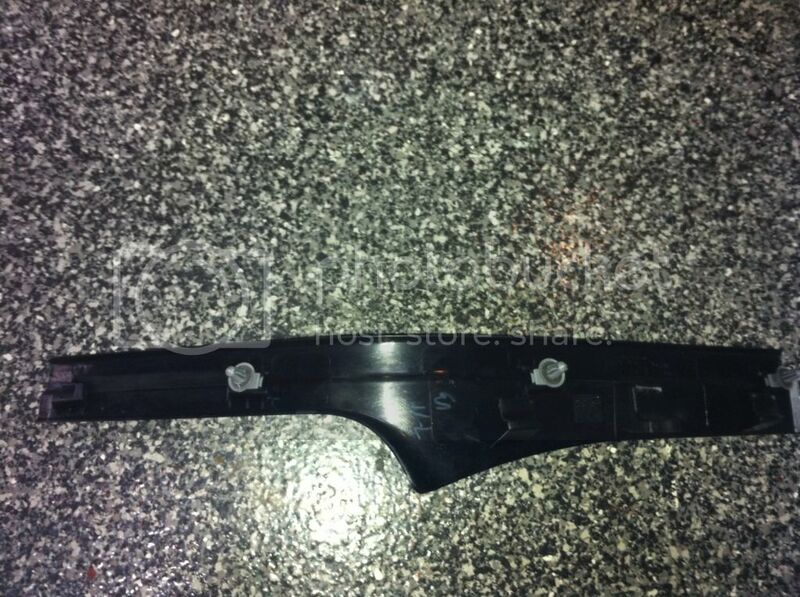 Remove some of the black cloth tape BMW used to wrap all the wirings together. Remove enough so that you can easily work with each of the wiring pairs. 59. 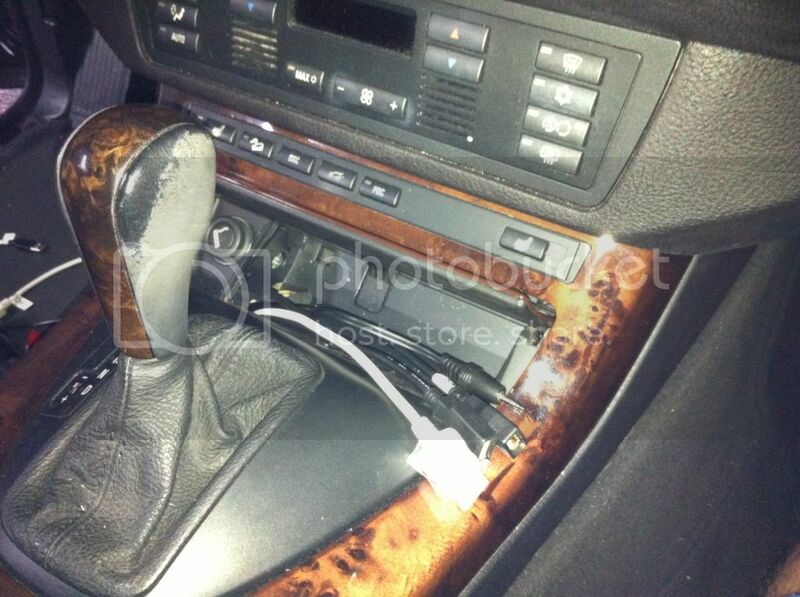 At this point, the only cable you should still have loose is the composite video cable for the rear backup camera. 60. 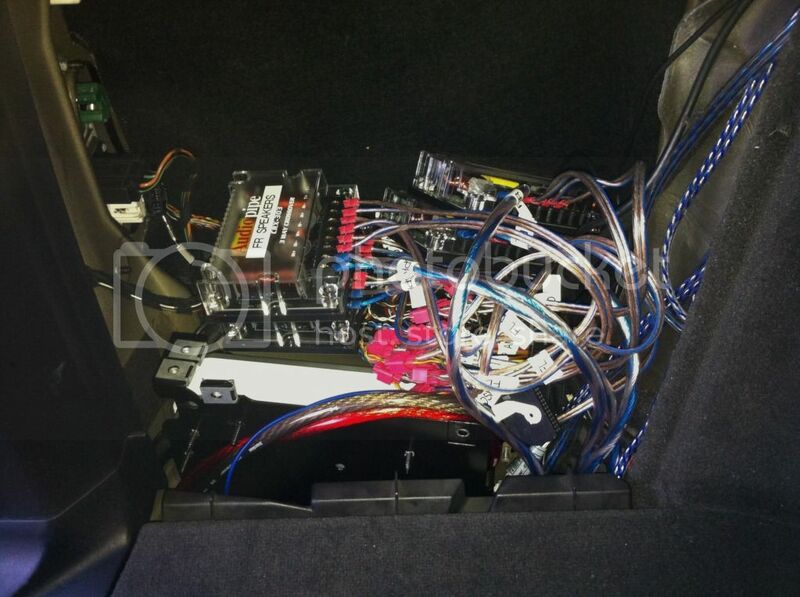 Connect all the wires to their associated labeled connections with the Dynavin head unit and harnesses: mic, GPS antenna, USB1, USB2, 3.5mm AUX R/L, iPod, FL/FR/RL/RR/Sub RCAs, radio antenna, Fakra plug, and the steering wheel control module (small black plastic box that came with the Dynavin accessories. 61. If you have the Dynavin Android unit, connect the Dynavin wifi USB stick to the USB extension cable in the ashtray compartment that you labeled as USB wifi. Note: you can attach the wifi USB stick to the USB plug in the back of the Dynavin head unit, but I decided to use an extension cable as I did not want it to accidentally get disconnected and lost in the dashboard in the future. 62. 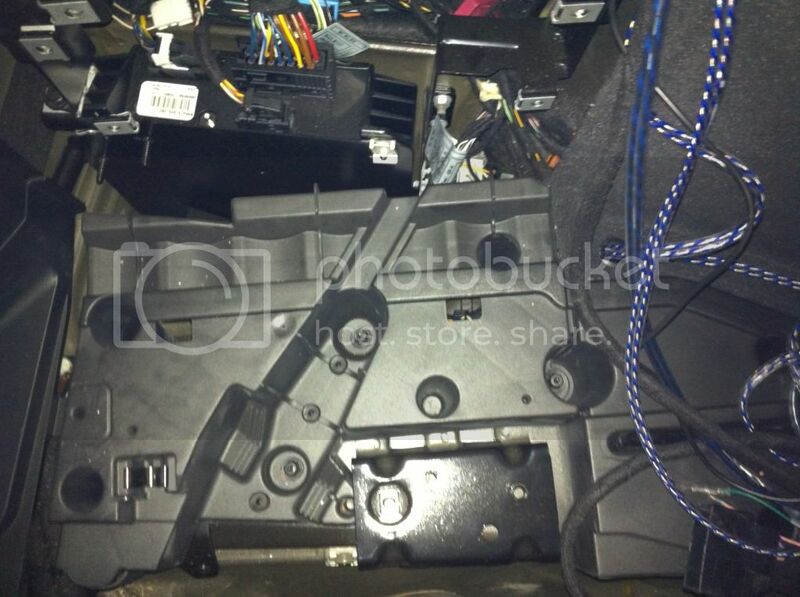 I did not use the head unit bracket supplied with the Dynavin E39 D99. 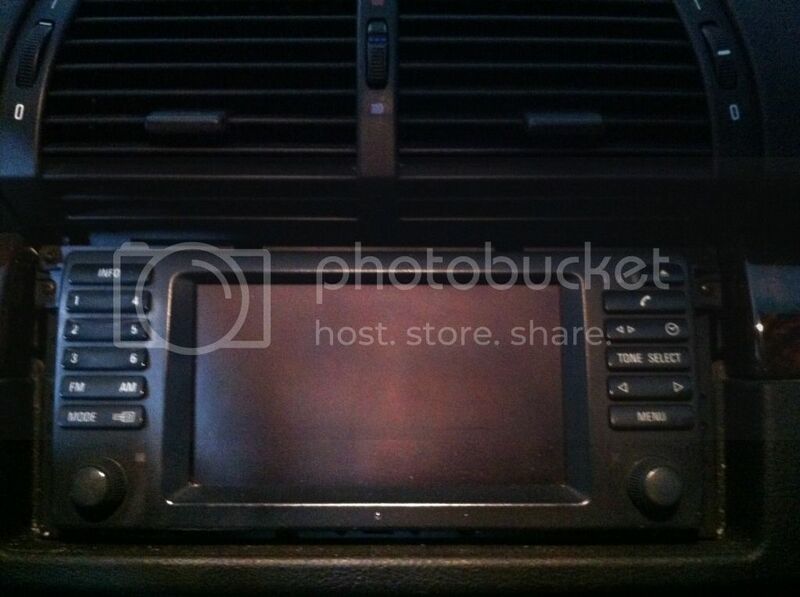 It looked like too much work to attempt to remove the existing stock nav bracket in the dash, and I wasn't sure if it would even fit properly since it was made for an E39 dash. The Dynavin head unit will slide right in to the existing nav slot in the dash, and the stock nav bracket holds it in place. The Dynavin is held in place very securely with just the normal pressure from the contact with the dashboard, and can still easily be pulled out using a trim removal tool. So I did not see any need to attempt to replace the mounting bracket. 63. Self explanatory: connect negative terminal from battery, secure air suspension component (if you have a 4.4i), reattach the plastic bracket between the spare tire well and the left compartment (making sure the amp power, ground, and remote turn on cables are clear of any obstructions), put the spare tire back in. As for the composite video cable for the rear backup camera, that installation will be a project in and of itself (to be continued…). 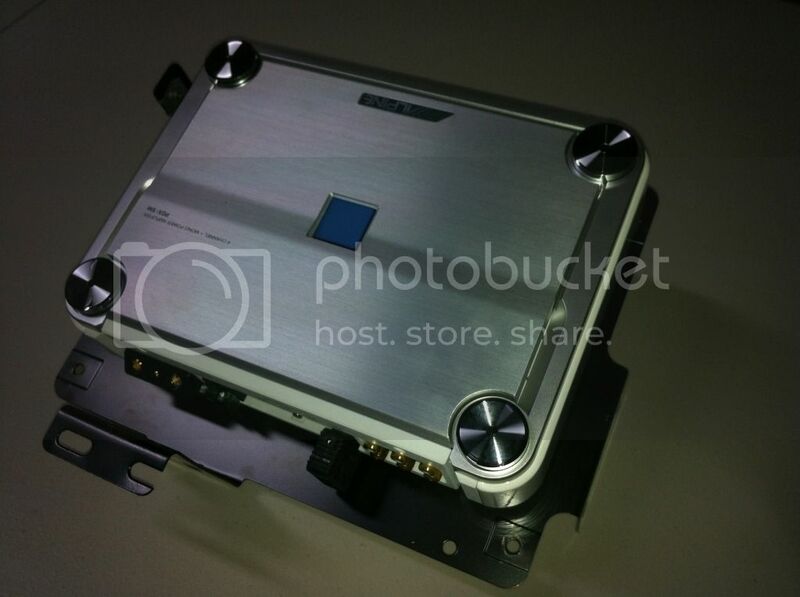 You might also noticed that the stock subwoofer is not connected to the new amp. I'm planning on replacing subwoofer in the near future as well (based on the custom box dimensions provided in other threads on this forum: http://www.xoutpost.com/electronics/...-included.html), so I did not bother tapping into the stock subwoofer speaker wires at this time since I'll be running new subwoofer speaker wires when the time comes (to be continued…). A comment about the speedometer cluster and MID info. I can still use the button on the signal stalk to cycle through the OBC/MID info and receive warning notifications, plus outside ambient temperature reading. The only drawback is that you cannot reset/adjust any of the OBC/MID info (e.g. internal clock, timer, average fuel consumptions, etc.). If this is really important to you, you can pick up a used MID from a non-nav X5 and extend the MID harness detached from the stock 16:9 nav head unit into the glovebox compartment. 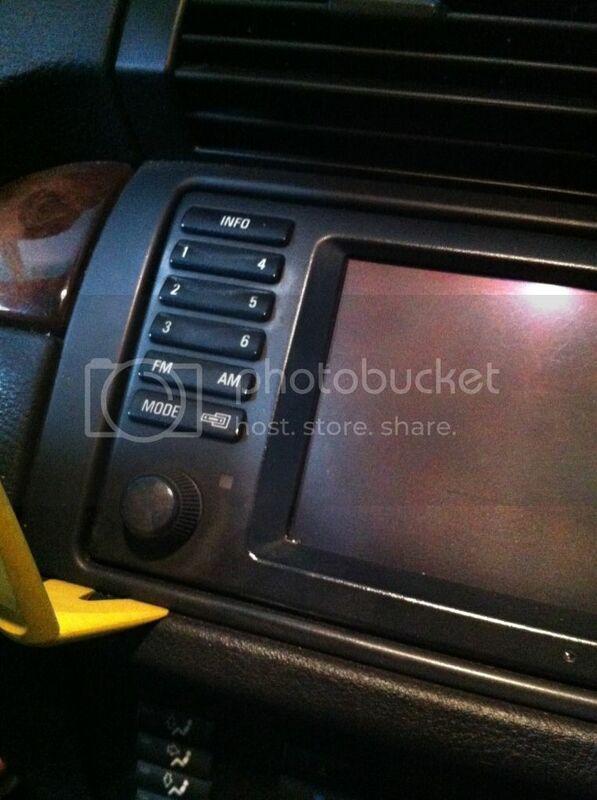 I might do this in the future if I can grab a non-nav MID for cheap.